Malcolm Tween Print from Celebrations Japan. Mighty Jabba let me know of this superb Malcom Tween print from Celebrations Japan. Beautiful. I’d not heard of this artist before, but after a bit of searching on the web, it would appear that this Celebration V print is also by Malcolm Tween. 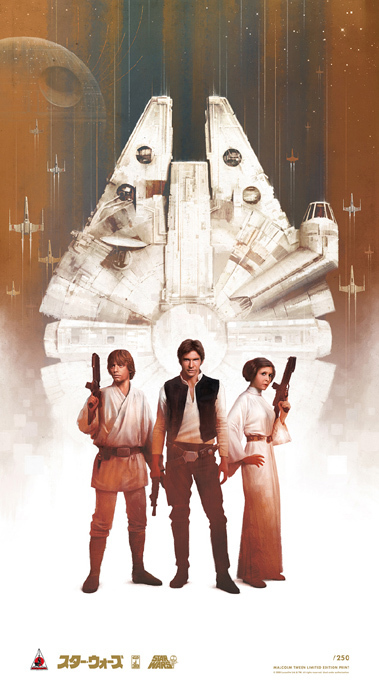 This entry was posted in Art and tagged Art, Malcolm Tween, Millenium Falcon, Millennium Falcon, Star Wars. Bookmark the permalink. 2 Responses to Malcolm Tween Print from Celebrations Japan. This is the first Malcolm Tween I had ever seen, and I love it! I have number 94 in my collection! Oh i agree 100%. Thanks to icruise i have a chance to nab one from a guy on the RS forums. I’m waiting to see how much shipping from Japan’s going to be.